What is a Long–Term Confinement Area? The size of the zone depends on the size of your puppy, but shouldn’t be so big that they have potty accidents anywhere but in the designated potty area. This kind of confinement helps to potty train your puppy, prevents destructive chewing, keeps them safe from household hazards, and helps them learn that being alone is nothing to worry about. Their puppy zone is managing their environment to help them make good choices about where to potty, what to chew on, and how to entertain themselves when you’re not around. Crate or Sleeping Area: Have your puppy’s regular crate on one side of the zone, with the door left open so your puppy has easy access when they want to rest. Make sure the crate has appropriate chew-proof bedding. You can tape down your dog’s bed so it stays put and can’t be pulled out and chewed on. If you have a power chewer puppy who is most likely to rip up their bed (and the tape), a bed like this indestructible raised cot is a great chew-proof option. I highly recommend crate training your puppy, but if you choose to not use a crate, provide a comfortable sleeping area in one corner of their puppy zone. Note: Putting their crate inside the long-term confinement area has multiple benefits. It's not only the place they can go to sleep, but it builds positive associations with the crate. Having easy access in and out of their crate to their comfy bed reinforces that it's a great place to be by choice, and that the door isn't always closed on them. 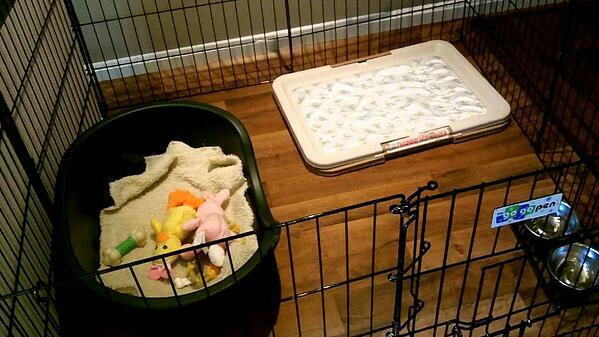 Designated Potty Area: This area should be as far away from the crate and sleeping area as possible. Tape down puppy pee pads or use an indoor turf potty spot. Creating a potty spot with raised edges — like this dog litter box option — helps prevent toys from being pushed into the potty zone. Because the entire confinement area shouldn't be papered with newspaper or pee pads, you'll want to make sure that this area is set up in a place where your flooring is more durable or not as "precious" to you, like a laundry room or tiled kitchen floor. Appropriate chew toys: Choose toys that are safe to leave with your puppy while they’re unsupervised. This could include interactive treat toys to help them pass their time and stimulate the brain. Food: Your puppy’s food should be given in a stuffed Kong toy or similar work-to-eat toys. You can tether Kongs to the edge of the puppy zone to prevent them from rolling into the potty area. Simply thread a rope through the Kong and tie a knot on one side, pulling it tight inside the Kong before stuffing and tethering. (If your dog loves to chew and you think they'll chew through the rope tether, try a different style of work-to-eat toy for your pup's safety). Check out some of our favorite interactive feeders to try with your puppy. Water: Place your puppy’s spill-proof water bowl or hang up a no-drip water bottle near their sleeping area. You’ll want to make sure your puppy has a positive association with their designated zone, and you’ll want to introduce the area similarly to how you introduced your puppy to their crate. You want them to love being in their puppy zone; your puppy will learn that their zone is where all the good stuff happens! 1. Take your puppy out for a potty break or walk. 2. Put your puppy in their puppy zone and give them a stuffed Kong or other high-value chew toy. 3. Leave your puppy alone with their yummy treat for a few minutes. Don’t make a big deal about leaving them there without you. The more fuss you make about leaving, the more likely your puppy may develop problems with being away from you (and that's no fun for anybody!). This step is done while you stay home or leave for a very short period. See step 5 for more detail. 4. Let your puppy out of their zone, preferably before they finish de-stuffing their kong. Keep your return low-key — you want your dog to learn that humans coming and going is no big deal. 5. 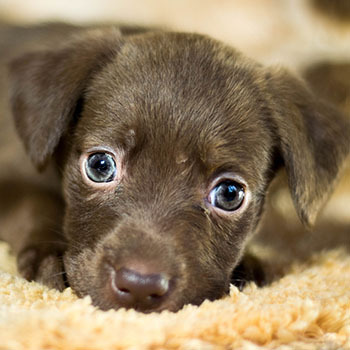 Repeat steps 1–4, gradually increasing the length of time your puppy is alone in their area. Practice this a few times throughout the day, every day. You can start leaving the house for a few minutes at a time as your puppy practices being alone. Go check the mail or take the trash out. Start small and gradually build up to running short errands or, if you have children, picking them up from school while your puppy hangs out in their zone. Does your puppy bark or whine when you leave them in their zone? Be careful not to give them any attention, go back to them, or let them out when they do this. You don’t want your puppy to learn that barking gets them your attention or being let out of the zone. Instead, wait until they’ve been quiet for 10–15 seconds before you give them any attention or let them out. Plug in a calming pheromone diffuser in the same room as the puppy zone (but not somewhere where your pup can reach or chew on it) to encourage relaxation and calm behavior. Make sure that their zone has enticing chew and work-to-eat toys available, so your puppy has something fun to do while alone. This can help prevent boredom barking and provides great mental enrichment. Give your puppy some exercise before putting them in their designated area. A tired puppy is a good puppy, and if they’re tired from a walk or a game of tug, they’ll be less likely to boredom bark and more likely to settle down for a nice, long nap. As your puppy matures, you can start to make the area larger to help transition to leaving them alone in the home unsupervised when they are an adult. Use the puppy zone whenever you need to leave your pup unsupervised longer than they can be crated. You’ll have more peace of mind knowing that your puppy is safe, comfortable, and not chewing your couch to pieces while you’re away.